What is Import in Textile and Apparel Business? Import trade refers to the purchase of goods from the foreign country. The procedure for import trade or import procedure differs from country to country, depending upon the import policy, the statutory requirements and customs of different countries. In almost all the countries of the world, import trade is controlled by the government. What is the Procedure to Import or Import Procedure in Apparel Business? An enquiry is a written request from the intending buyer or its agent for information regarding the price and necessary terms on which the exporter and terms on which the exporter will be able to supply goods. A firm or a person cannot import goods in any country without a valid import license. An import license may be either general license or specific license. It should be noted here that, goods can be imported from any country under general license, whereas individual license permits to import only from definite countries. Established importer is a person, imported goods or materials of the class in which he is interested during the basic period prescribed for such class. Registered exporter importing against exports made under a scheme of export promotion and others have to obtain license from the chief controller of exports and imports. If the person [importer] imports goods for his own use in industrial manufacturing process is known as actual users. It is one of the most important points of import procedure where importer has to make payment for imports in the currency of exporting country. The foreign exchange reserves of any country are controlled by Government and are released through its central bank. In Bangladesh, the importers have to submit an application in the prescribed form along with the import license to any exchange bank as per the provisions of exchange control act. Scrutinizing the application on the basis of exchange policy of government of Bangladesh in force at the time of application. Bangladesh Bank sanctions or rejects the release of foreign exchange. This order is known as Indent. It contains the instructions from the importer so as to the quantity and quality of goods required, methods for forwarding them. All the required particular of goods, prices etc. are not mentioned in opened indent. A confirmatory indent is one where an order is placed subject to the confirmation by the importers agent. Exporter wants to be sure that there is no risk of non-payment. Usually for this purpose he asks the importer to send a letter of credit (L/C) to him. A letter of credit is popularly known as L/C. On the receipt ofletter of credit (L/C), the exporter arranges for shipment of goods and sends an advice note to the importer immediately after the shipment of goods. After that, the exporter draws a bill of exchange on the importer for the invoice value of goods. Here, the shipping documents like as the bill of lading, certificate or origin, invoice insurance policy, customer invoice etc. also attached to the bill of exchange. These types of attached exchange documents are known as documentary bill. This type of bill is forwarded to the importer through a foreign exchange bank which has an agent or branch in the importers country for collecting payments of the bill. 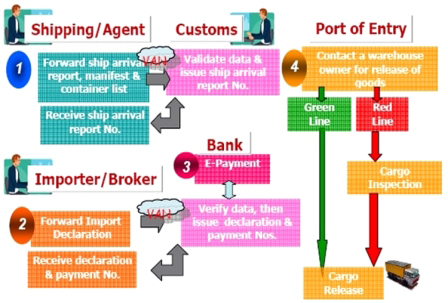 After receiving necessary documents of title of the goods, in this stage, the importers only concern is to take the delivery of goods when the ship arrive at the port and to bring them to his own place of business. It is also one of the most important parts of import procedure. Here, the mode and time of making the payment is specified according to the terms and conditions as agreed to earlier between the importer and exporter, usually 30 to 90 days are allowed to the importer for making the payment of D/A and D/P bills. Last step in import procedure is closing the transaction. But if he is not satisfied with the quality of goods he will write to the exporter and settle the matters. The insurance company will pay him the compensation under an advice to the exporters if the goods have been damaged in transit. If you follow the above import procedure, it will be very easy for you to import your required goods from another country.